Luminix Edge High Power LED Light Bar - 10 in. - 9 LED - 3600 lm - 11.64 in. x .75 in. x 1.5 in. - w/1.5 in. Luminix Edge High Power LED Light Bar - 10 in. - Flush Mount - 9 LED - 3600 lm - 11.89 in. x .75 in. x 2.2 in. Luminix Edge High Power LED Light Bar - 50 in. - 48 LED - 19200 lm - 51.63 in. x .75 in. x 1.5 in. Luminix Edge High Power LED Light Bar - 60 in. - 57 LED - 22800 lm - 61.63 in. x .75 in. x 1.5 in. Luminix Edge High Power LED Light Bar - 40 in. - 39 LED - 15600 lm - 41.63 in. x .75 in. x 1.5 in. 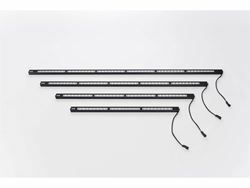 These LED light bars by Putco are 300% smaller than most LED light bars, but even more powerful with 3 watt / 0.25 amp power draw from each Nichia LED along with 50,000 hours of life. Putco Luminix LED lights comes with a wiring and are designed to work with 12V-36v without any modification. 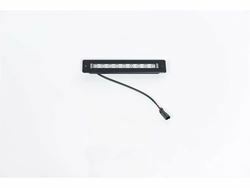 Each Luminix LED light bar includes a thermal control chip for over/under voltage protection and is rated to work from minus -100°F to 180°F. 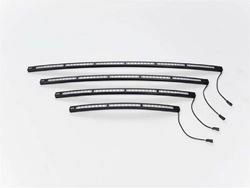 Available in straight or the unique radius light bars designed for applications such as on top of your factory bumper. 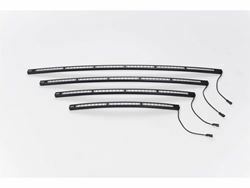 Mount these LED lights just about anywhere on your truck or SUV, from on the factory bumper, to the roof top, behind the grille, under the bumper, with a billet grill insert and more. Each light bar includes adjustable mounting brackets and made in a 6000 series aluminum housing with a matte black (flat black) finish. 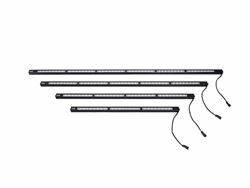 Available in sizes from 4" to 70" lengths including 4" blocks, 5" round, 10", 20", 30", 40", 50", 60", & 70" straight & curved LED light bar.